Get convenient, expert advice when choosing wine for dinner, a party or any occasion. 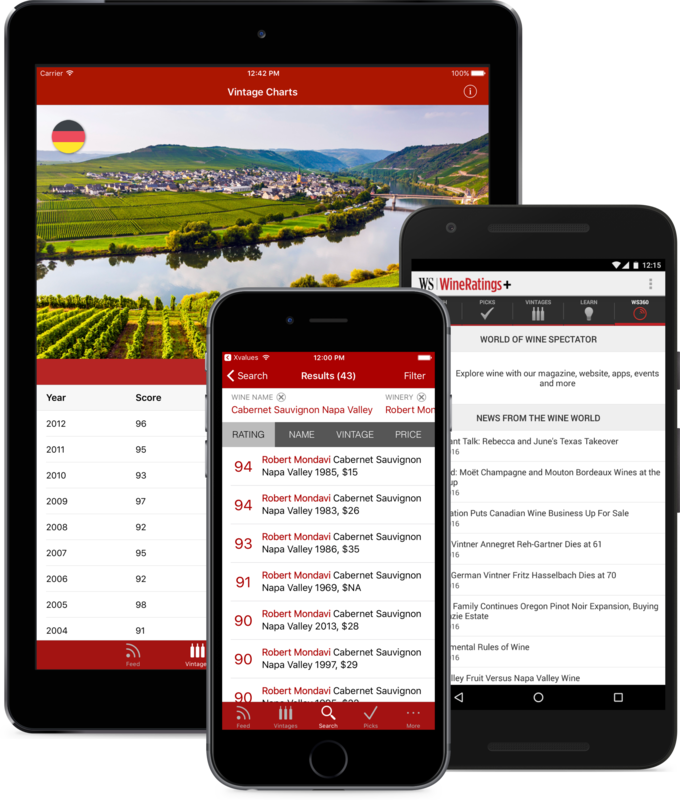 Wine Spectator's flagship Wine Ratings+ app lets you quickly consult all of our wine reviews—more than 300,000. Designed for connoisseurs and casual drinkers, this comprehensive app for iPhone, iPad and Android devices helps you make better choices, discover great values, learn about wine and stay updated on what's new. For a small monthly subscription fee, our powerful search gives you access to our editors' scores, tasting notes, release prices, current auction prices and drinking windows. Then save your favorites for future reference. The free download offers our extensive vintage charts, expanded wine education and a timely news feed. WineRatings+ is automatically updated (no download required) with the latest Wine Spectator reviews—at least 1,000 each month—so you can stay on top of new releases. Consult our reviews with confidence: Our experts follow strict blind-tasting methods to ensure fair, reliable results. WineRatings+ also includes a range of free content to expand your wine knowledge, including Vintage Charts summarizing quality and wine character for 55 key regions and grape varieties, educational Learn More articles and entertaining videos, and the WS360 news feed for a timely view into wine culture.